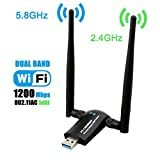 USB wireless internet or Wi-Fi adapters changed the way computers, laptops, smartphones, tablets and other devices connect to the network or internet. Previously, you had to rely on long cables, internal hardware, and external gadgets. And although it works, it was a little cumbersome, costly, and required higher costs of maintenance. In some instances, you were required to upgrade a computer to enjoy the benefits from a superior network. This innovative dual-band adapter will boost the network in many places. It comes in a mini size to fit in restricted spaces but still delivers amazing performance. The gadget is 3X faster than most devices in its range and can attain speeds as high as 6000Mbps. It supports 802.11ac and has two bands (2.4 & 5.0Ghz). The former reaches a maximum speed of 150Mpbs while the latter attains 433 Mbps max. The 5G wifi is perfect even for data demanding tasks like streaming HD video, playing online games, and more. It works with PC laptop, tablet and more. 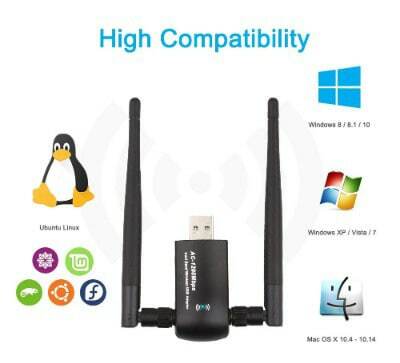 The small wifi router supports Windows (10 / 8 / 7 / XP / Vista), and Mac OS X 10.4 – 10.12.2. Installation is easy and it comes with a Set-up CD. 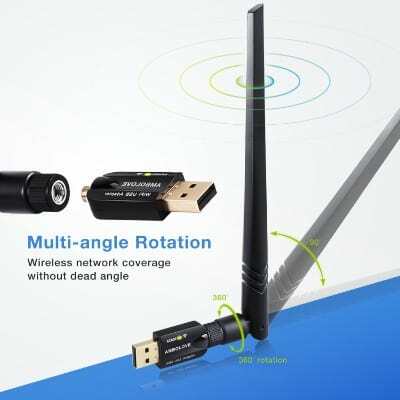 With this USB Wi-Fi adapter, streaming videos or playing online games will be more satisfactory. The Netgear Nighthawk AC1900 has sped up to 600Mbps (2.4GHz) and 1300Mbps (5GHz). It offers more connections due to the dual band and more bandwidth capacity courtesy 3×4 MIMO design. The gadget offers wider coverage and maintains a strong consistent signal throughout. Configuring it takes a short time and doesn’t require extra programs. It comes with a built-in windows configuration tool for quick linkage to a Wifi network. The device has multiple OS support to work with both Windows and Mac. 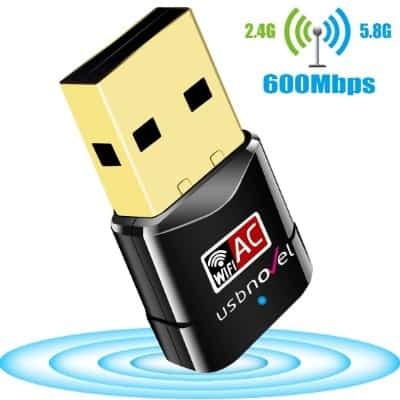 The ANEWKODI Wi-Fi adapter is based on the latest technology and will outperform many wireless adapters. It features a powerful RTL8812BU chip that processes data much faster. 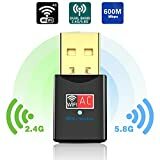 The dongle works with both 2.4G and 5.8G and is based on the most current 802.11ac Wi-Fi technology, which is up to 3 times faster than wireless N speeds. It will reach rates as high as 867Mbps on 5GHz and 300Mbps on 2.4 GHz. The combined speed will be 1200 Mbps (1.2Gbps)). The high performance and fast speed offer seamless streaming of HD video and will make online gaming more enjoyable. For better signal penetration and distribution, it relies on a 5dBi antenna. It supports USB 2.0 and 3.0 and is compatible with windows (10/8/8.1/7/Vista/2000,) Mac OS 10.9 and more OS. 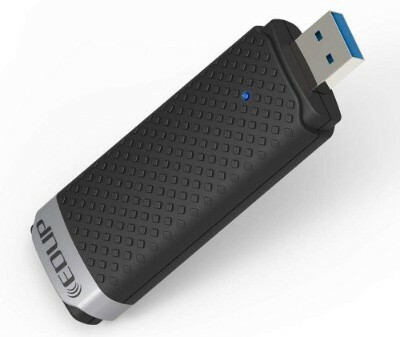 The EDUP Wifi Adapter has a top data speed of 1200Mbps. Streaming videos, playing online games, and other internet function will be easy. 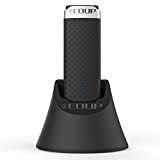 It is small and easily connects to desktop PCs, Laptops, tablets and more. 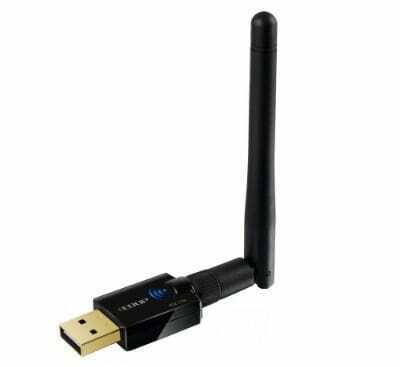 The dual-band gadget features 2.4GHz (300Mbps) and 5GHz (867Mbps). It has a high-gain antenna for improved signal reception and also to combat other frequencies. It is simple to install, easy to use, and you should be able to use it in a few minutes. You won’t experience freezing or lagging performance. 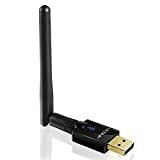 It works with Windows OS (10/8.1/8/7/XP/), Mac OS (10.9-10.13) and is also backward compatible with 802.11 a/b/g/n devices. 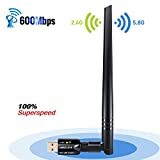 This wifi adapter that is compatible with 802.11AC and works faster than the common N speeds. The AMBOLOVE Wifi USB Adapter offers you faster speeds, superior performance, and consistent speeds. This gadget has two bands (2.4 and 5.0Ghz) and features superior wifi protocol for good performance. You won’t experience freezing screens, lags, and playing online games or streaming videos will be easy. The strong 5dBi antenna is more powerful and reliable than the 3dBi and 2dBi type and is Omni-directional for good coverage and consistency. It is good for PC Desktop, Laptop, Tablets, and Phones and is compatible with Windows OS (10/8.1/8/7/XP/Vista), Linux and Mac. 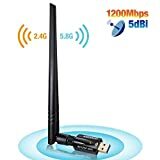 Capable of achieving data speed up to 300Mbps, this wireless adapter will improve the network reception and connectivity in your office, home, and other places. It works with Windows (10/8.1/8/7/XP/Vista/) as well as Mac OS X 10.6-10.13. 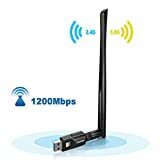 The easy to install device is compatible with PCs, laptops, tablets, and other gadgets and comes with a high gain external antennae and features a USB 2.0. Installing the device takes less than 3 minutes and requires no additional software or hardware. 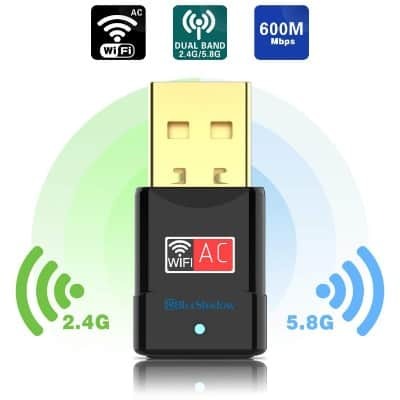 The Wi-Fi dongle supports any 2.4 GHz wireless router and maintains a strong signal throughput. It has a decent coverage of 100 meters plus and is tolerant to interference, distortion, and noise. The highly secure piece supports 64/128-bit WEP and 128 bit WPA standard (TKIP/AES). Designed to work with different OS including Windows XP, Vista, 7, Win 8, Win 10, and Mac OS X 10.6-10.13. 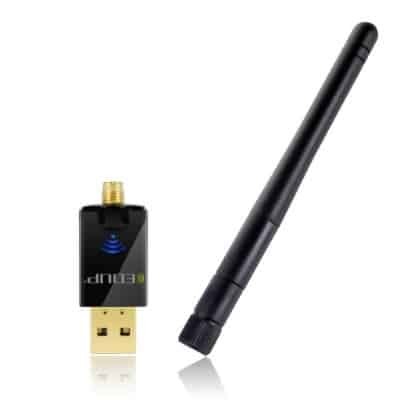 The gadget has 2 bands; 2.4 GHz (150Mbps) and 5.0 GHz (433Mbps) and can reach up to 600Mbps in term of speed. This also enables you to connect more than one device. 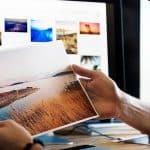 It upgrades desktop PCs to 802.11ac, and they will perform not only faster and reliability and bit the connectivity will be consistent. 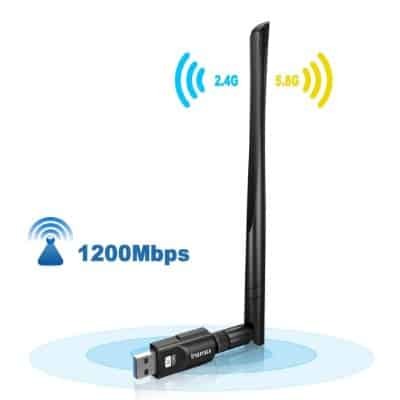 The two 2dBi antennas boost the strength and together with the superior Wi-Fi technology, it will be up to 3X faster than N speed. Streaming HD videos, playing online games, and surfing the net will greatly improve. It is more tolerant to interference or wayward signals and is also easy to install. The Inamax USB adapter will transform your slow and unreliable network into a superfast and reliable network. It has a decent speed of 12000Mbps and has 2 bands to cater for different need and devices. The 2.4 GHz band reaches up to 300Mbps while the 5.0 GHz attains a maximum speed of 867Mbp. The superfast USB 3.0 toggle is faster than most types in the current market. And despite its advancement and superior performance it is still backward compatible with devices running USB2.0 and USB 1.1. 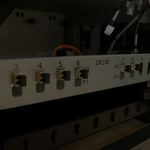 The included 5dBi external antenna will strengthen the connectivity and will still work in a weak network. It also maintains consistent performance throughout making it ideal for strong videos, online gaming, and other demanding chores. Creating the perfect Hotspot for other devices to connect isn’t as hard as you may think. You also don’t need to be a tech guru. With this adapter, you get a reliable connection point that has good coverage. 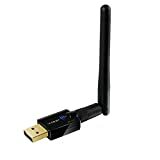 The Blueshadow USB Wifi Adapter is compatible with most OS including Windows XP Vista/7/8/8.1/and 10 and works with desktop Pcs laptops, tablets, phones and more. It has two bands; 2.5 GHz and 5.0 GHz. The earlier one attains a maximum speed of 150 maximum speed while the latter(5GHz ) reaches up to has 433Mbps. In total, the dual band is 600Mbps which is quite appropriate for most uses. Fitting the unit in the USB slot is easy and will start working without you having to configure or install additional programs or drivers. Scooping the first position is this adapter from TECHKEY. Although it may look small, it packs lots of power to run most devices on your home or office. Be it laptops, computers, tablets smartphone or any other internet-enabled device. It comes with dual-band and has a maximum combined speed of 1200Mbps. The 2.4 GHz band has a maximum speed of 300Mbps while the 5.0 GHz can reach up to 500MBps. The unit installs easily in any USB port and works within a short time thanks to being Plug and Play. 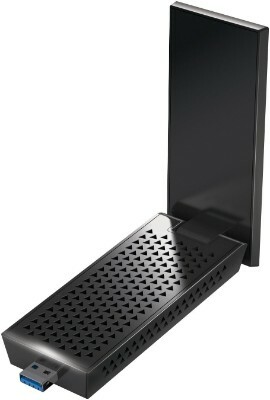 It features two 5dBi antennas for better coverage and will upgrade PCs to 802.11ac without a problem. This allows the network to perform better and also reduces chances of slow connectivity. It has a USB 3.0 socket which is more superior to most in the market and creates a nice Hotspot for linking with other devices. 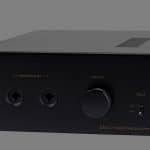 No Cables: Being a wireless system, you don’t require to connect wires or cables. You just fit the adapter into the USB port, and you’ll be connected. To connect many devices using cables, you require lots of them. This will create a cluttered space, and there is a possibility of the accidentally pulling out a cable. Easy To Use: Using a USB adapter is much easier than when using a wired system. It’s just a matter of fitting it inside the USB port and following some basic stapes. In a wired system, you may be required to strip wires, familiarize yourself with polarity, and also drill holes in/ walls, use clips, and connectors. This requires some skills. A Cleaner Space: If you have seen a space with several connecting cables, then you concur with me that it isn’t the cleanest of spaces. In fact, due to the cluttered environment, you may accidentally unhook a wire and then have to struggle to find a problem why you can’t connect to the internet. USB adapters are small, portable and don’t create a messy environment. No Internal Hardware: To use the internet or connect to an existing network, most computers and laptops will require you to fit a network adapter card inside or on the motherboard. This is a bit techy for most people, and they will have to call in an expert. Trying to perform the task may lead to damaging some parts. However, fitting a USB adapter is simple and easy even for a novice. Work with Multiple Devices: Normally, the cables or wires are usually fixed meaning that you can’t easily move with the computer or another device. But, with a USB adapter, you can simply remove it and use it in another device. It is lightweight and small, and also doesn’t need any configuration because it is Plug and Play. The cost of buying a single adapter is way lower than purchasing several wires and connectors not forgetting the labor cost. 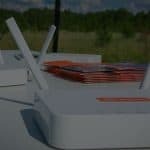 Call them wireless internet or Wi-Fi router, but one undeniable fact is that this device has made accessing and using the internet easier and more convenient. You no longer need to depend on long cables, install external hardware, feel limited by the available ports or spend more time and effort managing the different hardware and devices. 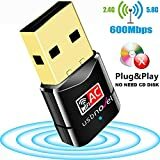 With the USB routers, you just plug the accessory into the USB port of your computer, laptop, tablet or any other device and join the network. The device is compatible with many items, lightweight and portable, and doesn’t require any maintenance. It comes in small space-saving design, and this maximizes the available space. 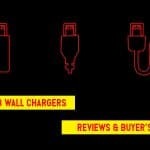 We have shown you the best USB Wi-Fi adapters on the market. Now, it is up to you to make the decision. What have you chosen?